Oh dear–I left out the cooking of the pasta, a rather crucial element of the dish! Thanks to Tunnza for tipping me the wink in a comment. 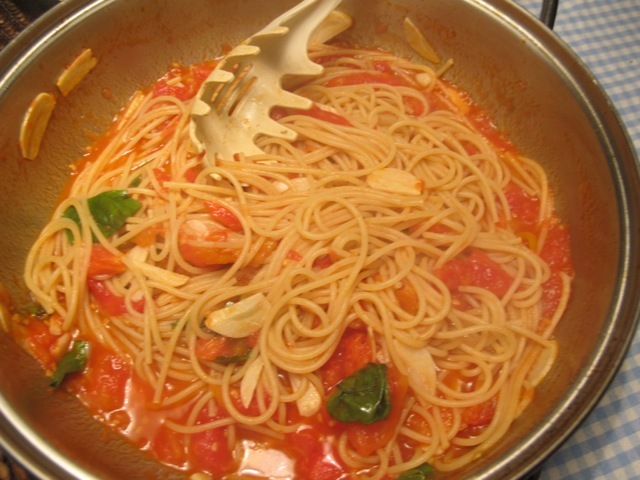 This sauce is cooked very quickly to retain the freshness of the tomatoes, so it’s best to put the pasta in the boiling salted water just after starting to cook the sauce. The timing should work but if the pasta is done before the sauce is ready, drain it and put it back in the hot saucepan with a swirl of olive oil. When the sauce is ready add the pasta to it and turn it over thoroughly. C’est moi qui vous remercie! I enjoy this type of recipe where the smell of garlic, tomatoes and spices fill the kitchen.